Design by Carlo Zerbaro and Alessandro Trentin, 2003. 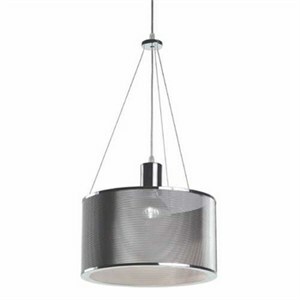 Pendant light for ambient illumination. Stainless steel mesh diffuser, satin finish steel canopy and fittings. Available in three sizes. Pendants are equipped with 6 feet of wire. Eclissi 30- 11.8" D X 6.7" H. Uses 1 X 100W max E26 (medium base) lamp (not included). Eclissi 40- 15.75" D X 6.7" H. Uses 1 X 100W max E26 (medium base) lamp (not included). Eclissi 50- 20" D X 6.7" H. Uses 1 X 100W max E26 (medium base) lamp (not included).